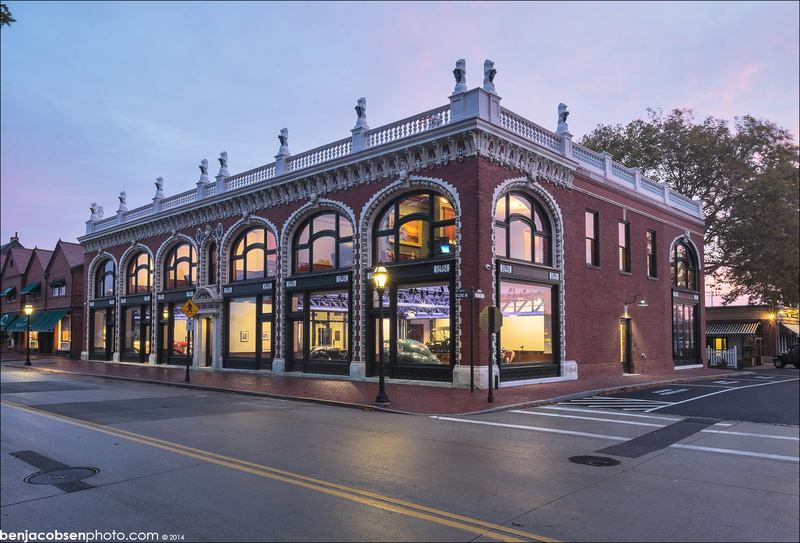 Noted architect Bruce Price designed the Audrain Building that was constructed in Newport, Rhode Island in 1903. 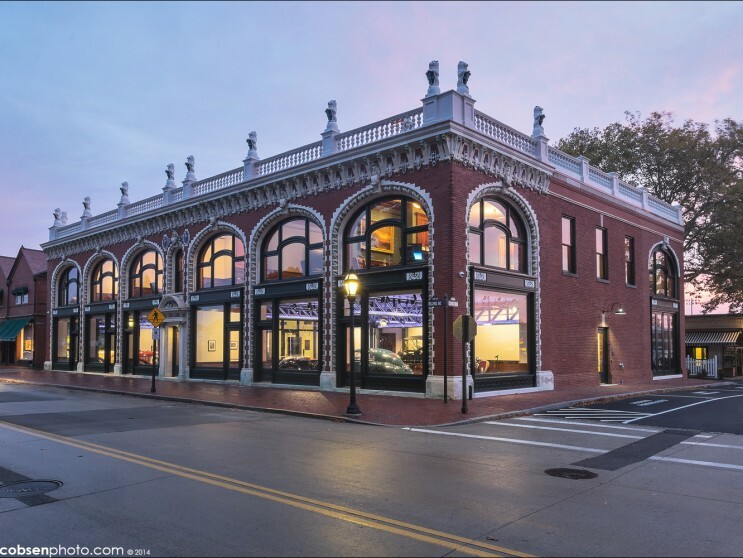 The commercial building represents one of four Gilded Age buildings that form an architecturally significant block on Bellevue Avenue. The three adjoining historic buildings include the Travers Block designed by Richard Morris Hunt; the Newport Casino designed by McKim, Mead, and White; and the King Block designed by Perkins and Betton. Price drew inspiration from the Florentine Renaissance to create an iconic two-story edifice defined by broad arched windows that rise through both stories and a roofline distinguished by white terra-cotta balustrade with lion sculptures. The Audrain building is faced in red brick with jewel toned terra cotta trim that accentuates the entry, bays and roofline. Street-level terra-cotta ornamentation is relatively restrained but increases at the arched second floor windows and cornice. 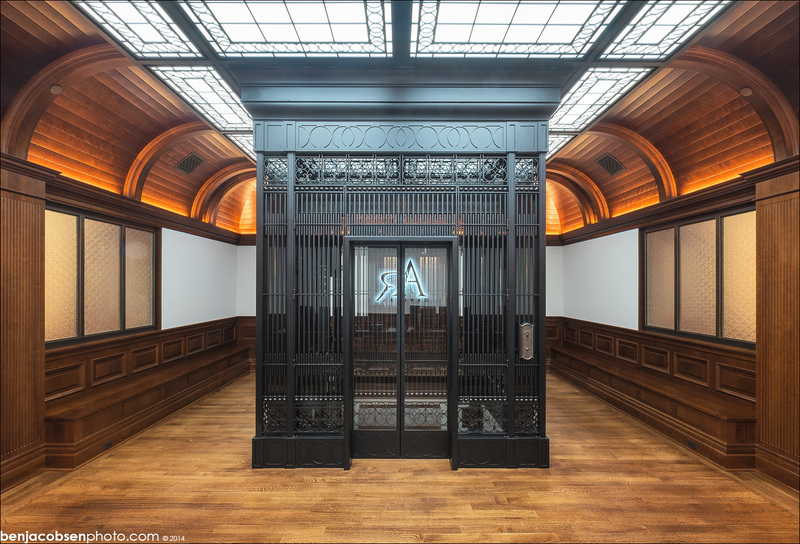 The first floor was originally designed to feature six retail shops and the second floor accommodated 11 offices. During the 20th century, a hurricane damaged the balustrade and the lion sculptures warranting their removal. Over time, the first floor retail shops transitioned into medical offices while the second floor housed many commercial tenants who made few improvements to the lackluster offices. In November 2013, the client enlisted NCA to transform the second story offices into summer headquarters for his Fortune 500 Company. During the renovation the building was sheathed in white plastic so crews could work around the clock to meet the fast track deadline. The project was completed in nine short months. Replicating and replacing missing terra-cotta ornamentation posed the greatest challenge for the exterior restoration. NCA relied on historic photographs to recreate the rooftop balustrade and lion sculptures. All of the windows were replaced with impact resistant glass. The South elevation was originally hidden by the neighboring Ocean House Hotel. The hotel was destroyed by fire in the 19th century, which made the unadorned South elevation exposed. The design team upgraded the sparse elevation with a large two story arched opening, three double-hung windows, and a new fire stair. The local Historic District required that the new South façade details be discernible to the observer by the simplification of replicated detail. 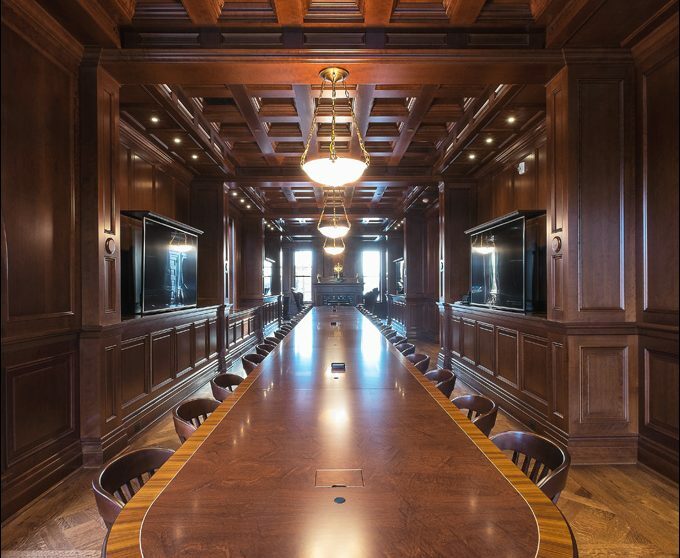 For the interiors, the client wished to emulate an early 20th century club. 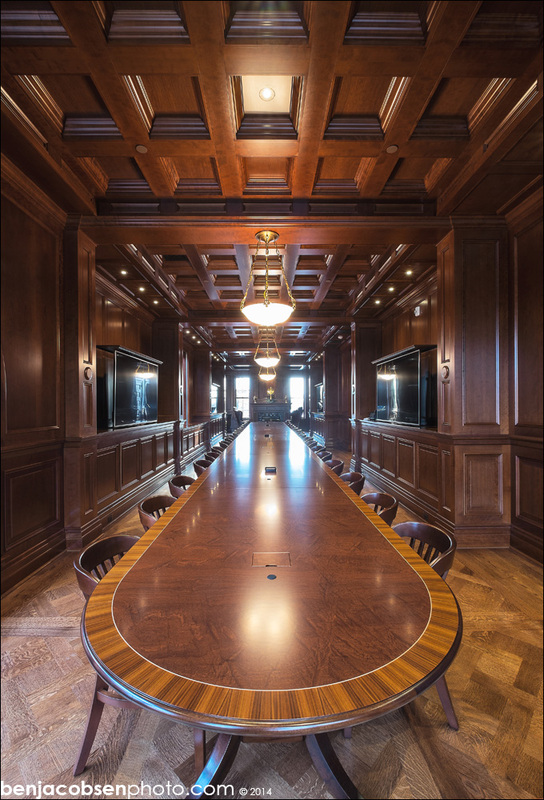 The bold concept called for reconfiguring the layout to accommodate a new carrera marble lobby, wrought iron caged elevator, 20’x20’ leaded glass skylight, barrel vaulted ceiling, six private offices, support-staff area, conference room, kitchen and restrooms. Members of NCA’s design team include Parker Construction, Camera/ O’Neill, Lana Nathe and BETA. 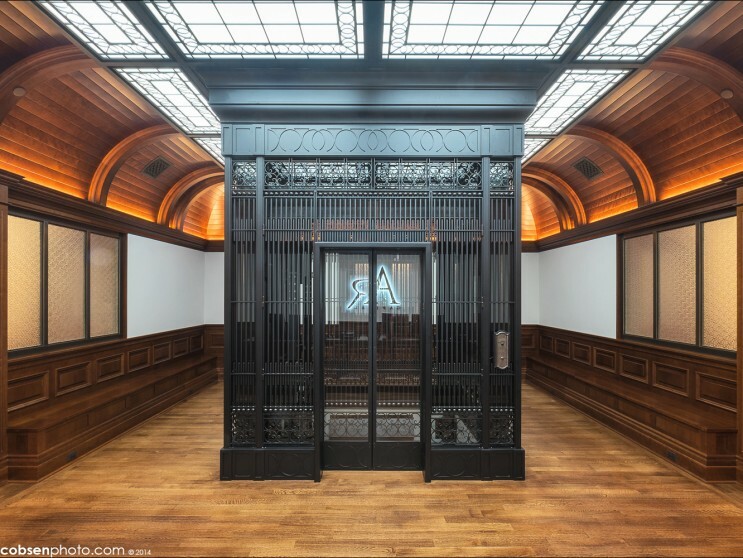 This project earned the 2014 AIA RI Honor Award, 2015 Doris Duke Preservation Award, 2015 Rhody Award for Historic Preservation and the 2015 Rhode Island Monthly Design Award.